Not Just For Campers - For Nature Lover's, Gardeners, and Out Door Enthusiasts Alike! A Kit in a Plastic Zipper Bag with Rope Handle - Includes 4 Products - Bug Away Spray, Cool Off Spray, Sun Guard Oil Spray, Jewelweed Oil Spray. Convenient to Take with You when Spending Time Outdoors. 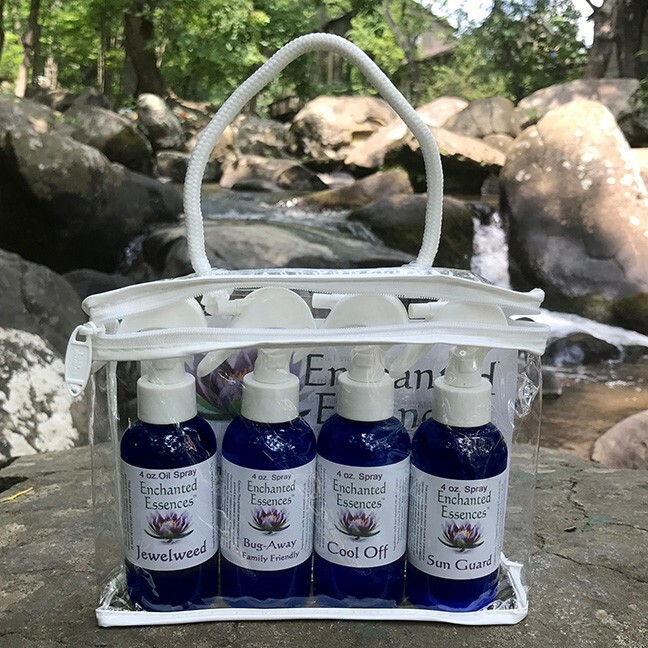 Naturally Protects from Bug Bites, Ticks, Over Heating in Hot Weather, Sunburn, Poison Ivy / Poison Oak without Harmful, Toxic Ingredients. Hand-made (by a Certified Aromatherapist) with Ingredients that are Organic, Plant-based, and Pure High Quality Essential Oils. No Synthetic Fragrances or Harmful Chemicals. A Kit in a Plastic Zipper Bag with Rope Handle - Includes 4 Products - Bug Away Spray, Cool Off Spray, Sun Guard Oil Spray, Jewelweed Oil Spray. Convenient to Take with You when Spending Time Outdoors. Naturally Protects from Bug Bites, Ticks, Over Heating in Hot Weather, Sunburn, Poison Ivy / Poison Oak without Harmful, Toxic Ingredients. Hand-made (by a Certified Aromatherapist) with Ingredients that are Organic, Plant-based, and Pure High Quality Essential Oils. No Synthetic Fragrances or Harmful Chemicals. -- Sun Guard - Contains: (*Organic) Fractionated Coconut Oil, *Jojoba Oil, Non-Nano Zinc Oxide, *Red Raspberry Seed Oil, *Herbal Infused Oils of Comfrey and Calendula, Essential Oils of *Lavender, *Spearmint, Carrot Seed, Vit E (Tocopherol). Directions: Unlock Sprayer by pushing tab in. Shake well before use. Spray onto skin and rub in until absorbed. Reapply as needed. Zinc Oxide is known for its ability to reflect, scatter, and absorb UVA and UVB rays. -- Bug Away Spray - Contains: 100% pure essential oils of: (*Organic) eucalyptus* (Dives and Lemon), lavender*, tea tree*, citronella*, lemongrass*, cedar* (atlantica and Virginia), geranium, (Bourbon and x asperum) patchouli* and liquid castor soap in distilled water. Directions: Unlock Sprayer by pushing tab in. Shake and Spray onto body and clothes to completely cover. Safe for Family including Dogs. Avoid contact with eyes. For Children Under 2 yrs, spray on Clothing Only. Repeat as needed or after 1 to 2 hours. -- Jewelweed Oil Spray: Contains Fresh Jewelweed Infused in Organic Olive Oil. Directions: To Unlock Sprayer - Push Tab in. Before Exposure as a Preventative for Poison Ivy/ Oak -- Spray onto Clean, Dry Skin. After Exposure to help Soothe and Relieve Itch -- Spray onto exposed area, Clean skin first if possible. -- Cool Off Spray - Contains: 100% pure essential oils of: (*Organic) *Peppermint (Mentha X piperita) and (Mentha arvensis), *Geranium (Pelargonium x asperum), *Rose Geranium (Pelargonium graveolens) in Distilled Water. To Unlock Sprayer - Push Tab in. Shake and Spray on body, on back of the neck, face (Eyes Closed) as desired for Relief from Hot Weather and Hot Flashes. Note: It is advised to avoid use with children under 6 years old because it contains *Peppermint Oil. *("Essential Oil Safety" - Robert Tisserand) Enchanted Essences Creates Products using Simple and Natural Ingredients. We believe that what we put on our Skin and Breath into our Lungs should be as Pure and Close to Nature as Possible. Chemicals, Synthetic Fragrances, Preservatives can Disrupt Hormones, be Toxic to the Body and Can lead to Health Issues. Plants, Essential Oils, and Plant Based Products can Offer a Natural Alternative that is Safe and Effective.